Andalucia is the second Spanish region with the largest number of airports, after the Canary Islands, due to the presence of facilities in Malaga, Seville, Almeria, Cordoba, Granada and Jerez and a heliport in Algeciras. Andalucian airports are modern, with international direct connections and a promising future because they are designed by and for tourism. That facet and the weight of the Costa del Sol have caused that Malaga airport is by far the largest air entry to Andalusia to the point that it accounts for 60% of total passengers and offers over a hundred destinations. The current airports “have nothing to do” with those of three decades ago. Everything has changed, from infrastructure to the type of carrier, to security measures or the shopping area. In 1982 Malaga airport has a small terminal with four counters and charter flights to England and Scandinavia, while direct flights were only domestic and very few. Today, charter flights have virtually disappeared and what predominates is the proliferation of low cost airlines, which have gradually gained market share with almost ridiculous rates and connecting the Andalusian airports with cities across Europe. Especially significant has been the case with Ryanair in Malaga. In 2008 its presence at the Costa del Sol airport was minimal. A year later, its eccentric president, Michael O’Leary, dressed as Santa Claus announced the creation of a base at the airport and two years later, Ryanair is the absolute leader at Malaga airport with nearly three million passengers, one million more than the second largest airline, Easyjet, also low cost. This change results in the fact that 40% of travelers passing through Malaga airport are flying from or to United Kingdom and it is easier and cheaper to fly from Costa del Sol to anywhere in Europe than to another Spanish province. It is less expensive to travel to Haugesund (Norway) than to Barcelona. The second major change experienced by the Andalusian airports in these three decades has been regarding to their infrastructure. All facilities have received a significant investment and belong today to one of the most modern transport networks in Europe. In 1991 was inaugurated Terminal 2 at Malaga Airport, named Pablo Ruiz Picasso. It has been instrumental in the growth of the facility, tourism and, therefore, of the provincial economy and Andalusia. However, the technicians and the airport director said at the time it was going to be small in 20 years and eventually became too small in eight. 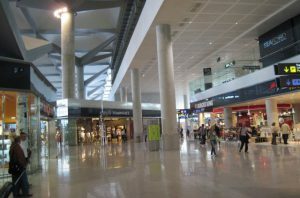 The lack of space led to the development of the Plan Málaga, which brings the greatest transformation in the history of the city´s airport. It has been created a new terminal that doubles its capacity to serve 9,000 passengers per hour. And in February is expected to open a second runway that will consolidate the airport in the top four in Spain and among the largest in Europe with an annual capacity of 30 million passengers.